Junior Kate Nance (left) dances down the track during one of the Bishop Champion Games events. The weather was warm and so was the atmosphere at this year’s third annual Bishop Champion Games. The Ohio Wesleyan Athletic Council sponsored the event; proceeds went to expenses for next year’s games. The games’ website said its events are geared to participants with special needs ages 8 and up. Sophmore Kylea Davis was in charge of the Games this year. She said she was “honored” to put on the event. “We can all learn a lot from each other, I feel it’s not the responsibility but we, as athletes, should be using our abilities to celebrate the abilities of other athletes,” she said. Student-athlete volunteers staffed the event. 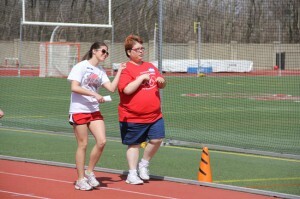 Some helped set up and cheer on the athletes, while others were assigned to be buddies of athletes. Buddies helped athletes find their way around and perform better in each event. Freshman Sara Johnson, a member of the OWAC, was assigned as a buddy. “He was a bit shy and wanted to sit with his parents first but after I showed him that we had balloon toss, he came out of his shell,” she said. After 10 minutes for the athletes to get to know their buddies, they were directed to their respective competitions, starting with the Softball Toss and the Football Toss. The athlete’s throws were measured and the top results were recorded, but the real point of the events was to have fun. After their turns, competitors would throw the balls around between themselves and with the volunteers, creating a friendly environment for everyone. Next up, the athletes competed in 20- and 50-meter dashes. The races went by quickly, and they were very interested to see how fast they could run. Junior Holly Fouch, another OWU student-athlete who helped with the games, said she learned a lot from the event that she plans to apply to her own athletic career. OWAC had a little more help with this year’s game from fellow NCAC school Hiram College. Hiram recently started its own athletic council and was looking for way to expand their program and give back to their community. “Going to other people’s events and seeing how they run them is definitely going to help us,” said Hiram freshmen Emily Mortimer. Hiram brought about 10 student athletes two hours and 15 minutes by van to the games to help and learn from the experience. Hiram senior Katie Valaitis said the collaboration with OWU is an effort to “raise awareness and knowledge,” building on other service-oriented campaigns like Relay for Life to garner support for a similar event there. I think it’s great and is something that more colleges should do,” she said. Johnson recalls the games’ closing ceremonies as her favorite part, and one of the most emotional. “(We all lined) up to create a tunnel for the athletes to run through during the awards ceremony,” she said.